Our academic program educates students about the importance of acting in a principled and ethical way. Students learn about the absolute imperative of academic honesty in every subject discipline, and in the study of literature, for example, many opportunities are provided to explore moral ambiguities and to discuss what the ‘right’ course of action should be. In examining the lives of others, students learn about themselves and how to act in a way that activates the inherently good qualities within themselves. Demonstrating commitment to learning by completing all assignments, being respectful and engaged in class and working collaboratively to support other students in the learning process are all ways in which the students demonstrably build character in the academic realm. 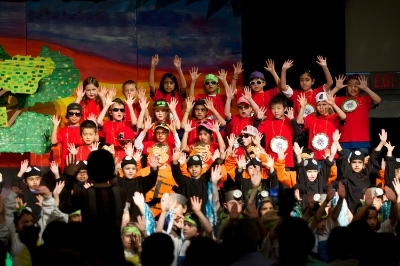 Students have many opportunities to develop and demonstrate character through the arts. For example, as part of a band, choir or dramatic production, students work collaboratively with everyone taking on different, but equally important roles to support the whole. Students learn to listen to each other and to trust one another as they work towards common goals. Students also develop the valuable traits of commitment and persistence as they learn to play an instrument, use new technology or practice lines for a play. We encourage students to build positive, resilient attitudes as we support them through such challenges as auditions, which often include having to deal with disappointment. Involvement in athletics provides opportunities for the development of admirable character traits such as integrity, courage and composure. We prescribe to the belief that through participation in athletics, the opportunity exists for teachers and coaches to model and teach character traits which are valued both on the field and in the school community at large. While coaches edify character and assist in the moral growth of athletes, countless situations and issues arise where students must make decisions based on the own moral reasoning. It is at these times when strong modeling is of great value. Service-learning provides an ideal way to develop and demonstrate character. In reaching out to others, be they their peers, younger students or people they meet through our service-learning partners, students learn that character is about how to interact with and treat other people. By participating in service-learning in the classroom, students are initially exposed to the moral imperative of helping others. Further opportunities presented to them challenge them to do the right thing – not because they have to, but because they want to.